The promotion of international cooperation in the area of accreditation and quality assurance is one of the key tasks assigned to the Accreditation Council by the German Länder. Therefor it is important to foster mutual understanding of quality assurance systems, to develop comparable criteria, methods and standards and to improve the transparency of the study programmes in order to encourage mutual recognition of qualifications and thus student mobility. The Accreditation Council is a long-standing active member in the responsible European and international networks of Quality Assurance such as the → European Association for Quality Assurance in Higher Education (ENQA) (membership 2000-2018, affiliate of ENQA since 2018) and the → International Network for Quality Assurance Agencies in Higher Education (INQAAHE). It regularly takes part in international working groups, meetings and conferences and is represented in the → European Quality Assurance Forum, in the European Quality Audit Network as well as in the ENQA working groups “Internal Quality Assurance” and “Impact of Quality Assurance“. Through the commitment of its members as well as project officers in committees, group of experts or international quality assurance agencies the Accreditation Council is able to contribute its expertise at an international level and simultaneously learn from the experience of international partners. 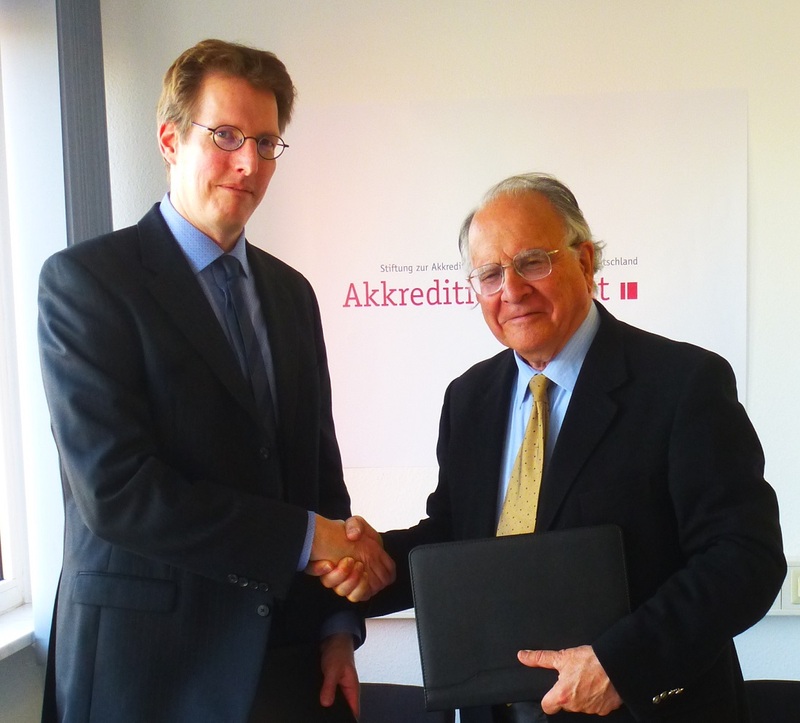 The German Accreditation Council has signed agreements with quality assurance institutions in Japan, the United States and Chile. It therefore fulfils its statutory mandate to foster international collaboration in the field of accreditation and quality assurance (§ 2 (2) and (3) of the Accrediation Foundation Law). Memorandum of Understanding with Japan's National Institution for Academic Degrees and University Education (NIAD-UE) in English and German. 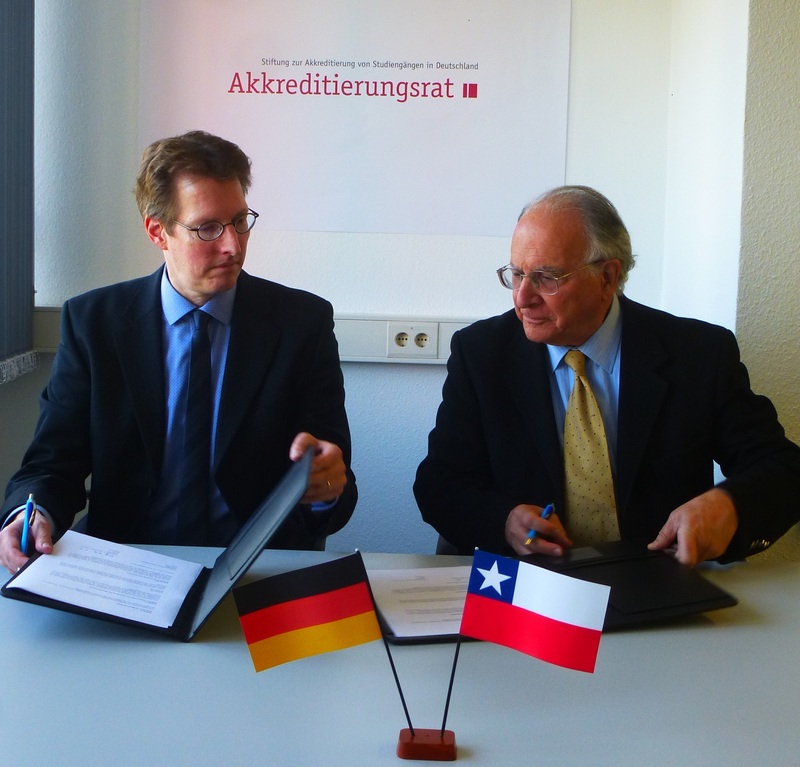 Dr. Olaf Bartz, managing director of the German Accreditation Council, and Professor Alfonso Muga, president of CNA-Chile, signing the Memoradum of Understanding between GAC and CNA-Chile on November 30, 2016. (Dr. Bartz acted in place of GAC Chairman Professor Grimm). Quality assurance is one of the key instruments for the realization of a European Higher Education Area. Comparable criteria, methods and standards are crucial for the recognition of degrees and hence for the development of transnational mobility. The Standards and Guidelines for Quality Assurance in the European Higher Education (ESG) set the benchmarks here. The ESG were adapted in May 2005 by the ministers responsible for the higher education system at the Bologna follow-up conference in Bergen and were updated in Jerewan during the next follow-up conference. They constitute the referential framework for internal quality assurance at higher education institutions as well as external quality assurance and for quality assurance agencies within the European Higher Education Area. The Accreditation Council has extensively taken the ESG into account in its regulations and resolutions. This applies both to the accreditation of study programmes, system accreditation as well as to the accreditation of agencies. In this way, it ensures that the procedures and content-related requirements comply with international standards. In the external evaluation of the Accreditation Councils in 2013 the group of experts confirmed that the Accreditation Council extensively takes the ESG into account. In order to acknowledge the specifics of international study programmes offered by German and international higher education institutions, but at the same time keeping the effort for external quality assurance at moderate levels, the Accreditation Council developed special regulations for the accreditation of Joint Programmes. According to this, the quality standards of the Accreditation Council and the Länder must be complied with in the entire program. But exeptions are possible in case of contradictions between the international regulations. The Accreditation Council will be responsible for approving them. In addition, international and German accreditation agencies may carry out joint accreditation procedures and international accreditation decisions can also be recognized. The special regulations for the accreditation of Joint Programmes and the prerequisites for the recognition of decisions are outlined in the Accreditation Council’s Rules for the Accreditation of Study Programmes and for System Accreditation. Implementing the Strategy for Internationalization of the German federal government and the Länder and in cooperation with the DAAD, a working group of the Accreditation Council is currently deliberating how the accreditation of Joint Programmes can be facilitated and how the recognition of accreditation decisions in this area can be promoted. For this purpose, i.a. the accreditation of Joint Programmes was surveyed in 2014 systematically. The results of the working group will be a factor in the process of the overhaul of the regulations of the Accreditation Council anticipated for 2016. As an important first step the accreditation of Joint Degrees has been simplified. This is based on the "European Approach for Quality Assurance of Joint Programmes" the ministers of the European Higher Education Area had agreed in May 2015 in Yerevan/Armenia. Furthermore, the Accreditation Organisation of the Netherlands and Flanders (NVAO) and the German Accreditation Council have signed an agreement on the mutual recognition of accreditation decisions. This allows consortia, which involve German and Dutch or German and Flemish universities to choose either a German agency or the NVAO for the accreditation of Joint Programmes leading to a joint degree. The decision will be subsequently recognized by NVAO or the German Accreditation Council. The agreement is available in German and English. In addition to its cooperation in international associations and networks the Accreditation Council also is a partner in diverse international projects. The Accreditation Council participated in the project → QACHE – Quality Assurance of Cross-border Higher Education. This project was co-funded by the Erasmus+ Programme of the European Union. Together with ENQA and six other quality assurance organizations the Accreditation Council has elaborated recommendations on how to handle the challenges of cross-border higher education and to ensure high quality of transnational programs. This does not concern Joint Programmes but study programmes in which the students are in a country that is different from the one in which the program provider is located. The project ran until March 2016. The Accreditation Council i.a. composed a country report, which contains an appraisal of German higher education institutions abroad and of their quality assurance. In the → Tempus-Project QUALYCERT the Accreditation Council together with TU Dresden, seven universities in France, Italy, Czech Republic and Tunisia as well as additional project partners has attended the development of quality standards for teaching and learning in Tunisia and also the training of experts for quality assurance in the higher education sector. The project ended successfully in October 2013. As a European representative the Accreditation Council also supported the → EU-program EDULINK in East Africa to promote the development of central quality assurance facilities at three institutions of higher education in Uganda, Tanzania and Kenya. The Accreditation Council contributed its expertise on the development of internal and external quality assurance mechanisms to several workshops, seminars and courses. The project was completed successfully in April 2011. The Accreditation Council always takes up its experience from cross-border, international projects for its own rules of accreditation. For example, it participated in a pilot procedure on the accreditation of a Joint European Master within the scope of a project by the → European Consortiums for Accreditation (ECA). These findings where used to evaluate and further develop the rules for the accreditation of Joint Programmes.